The global incidence of dementia is set to increase. It is estimated that two thirds of people with dementia live in care homes. To ensure good care experiences for these people, it is essential that the factors which create positive care home environments are understood. This article presents findings from a literature review of factors influencing care home experiences for people with dementia. 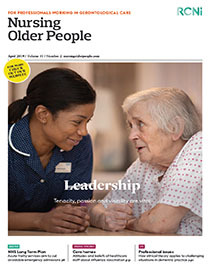 The main findings were that organisational culture and workforce development are important factors in creating positive care home experiences for people with dementia. Although the evidence is limited, a person-centred approach based on research evidence is essential if the workforce is to gain the necessary knowledge and skills to provide positive experiences of care for residents with dementia.